baráon [brr?n] (plural baráons) noun 1. nobleman: a nobleman who belongs to the lowest rank of British or Japanese nobility, or to various ranks in some European countries 2. somebody powerful: somebody with power or influence an oil baron 3. medieval nobleman: in the Middle Ages, a nobleman who was given land in return for loyal service 4. cut of meat: a cut of beef consisting of a double sirloin, joined at the backbone [12th century. Via Anglo-Norman barun, Old French baron < medieval Latin baron- "man"] baron or barren? Do not confuse the spelling of baron and barren, which sound similar. 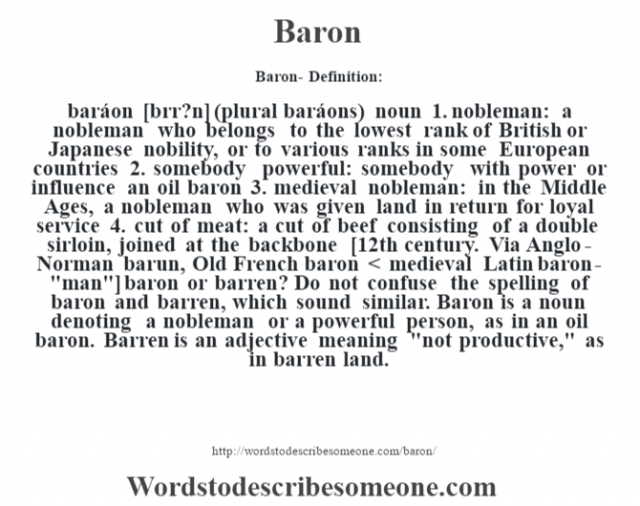 Baron is a noun denoting a nobleman or a powerful person, as in an oil baron. Barren is an adjective meaning "not productive," as in barren land.